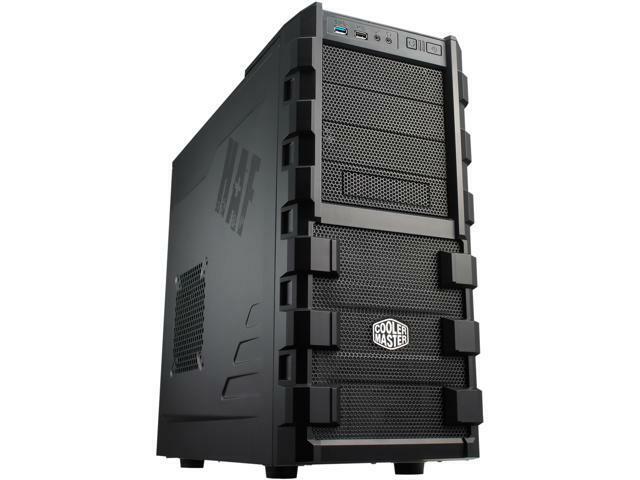 HAF 912 features rugged looks, trademark interior that signifies performance and massive air cooling to provide the best thermal solutions, makes it a killer machine in the HAF family. HAF 912 will support a 120mm radiator or just about any high-end CPU coolers to increase cooling performance. Furthermore, the spacious interior accommodates six 120mm fans for better and superior airflow yet, enough to fit 12 devices and high-end GPUs. 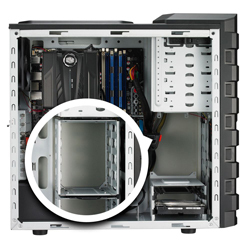 HAF 912 features rugged looks, a meshed front panel that allows substantial airflow to pass through the chassis. Capable of supporting up to Six 120mm Fans, a 120mm radiator in the rear, and high-end CPU cooler in a perfectly sized enclosure. 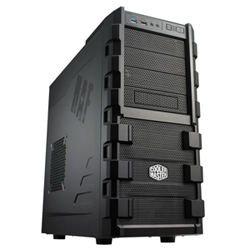 Removable 3.5" HDD cage provides enthusiasts more convenient installation for long graphic cards. 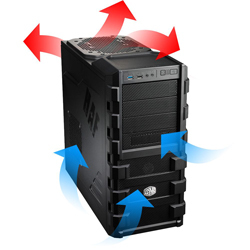 Designed to enhance the flow of air, strategic placement of fans provide optimum cooling for any hardware component that is worthy of the highest performance. 18.90" x 9.10" x 19.50"
Pros: Ton of room, fits my Hyper 212+ cooler, 4 120mm fans, and my 5770 while keeping it all very cool. Build quality is great, and there is enough room to cleanly route all my cables behind the motherboard tray. Edit: They still sell these? I've owned this case 8 years now and it still gets used. It has aged well and while I wouldn't pay $70 for it today due to not using 5.25" bays anymore and using a 240mm All-In-One liquid cooler, I have to say I miss the high air flow from the mesh front panel that is rare these days. I'm still using screws from the generous bag they give you to this day. Cons: Only one tool-less optical drive bay, thumb screws on only one side. Front side panel eventually developed a rattle but it has been 8 years! Dust filters were always a pain to get at. I have broken a few 3.5" drive rails just squeezing them to pull them out. 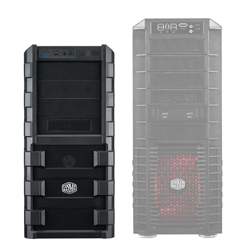 The case has been surpassed by newer Cooler Master cases for less money unless you still need 5.25" bays or have a couple of 200mm fans you just don't want to part with. Other Thoughts: I made it through shipping without even a scratch. Was used in my first full build. I will always have a soft spot for it. Pros: Everything. It's compact, yet has room for days. This Case has survived plane flights. Road trips. Earthquakes. If you're smart, there's a way to mount a 240mm AIO in a push pull config. Keeps my 4.5ghz oc 8530 BE nice and cool, GPU as well. A) It has 4X 5.25 expansions (one of which is a combo 3.5 in a 5.25 used for floppy disk sized front panel components) in the front leaving you room for 1 or 2 optical drives if you wanna copy CD's, and still have room to add more things like a 40-1 media card reader<link>https://www.newegg.ca/Product/Product.aspx?Item=N82E16820223103&ignorebbr=1</link>, extra usb 3.0's<link>https://www.newegg.ca/Product/Product.aspx?Item=9SIA8W68C88012</link>, e-Sata/ firewire addons<link>https://www.newegg.ca/Product/Product.aspx?Item=N82E16811999176&ignorebbr=1</link> , Hot swap bay's<ink>https://www.newegg.ca/Product/Product.aspx?Item=N82E16817198068&Description=Hot%20Swap%20bay&cm_re=Hot_Swap_bay-_-17-198-068-_-Product</link> (this may need an additional part depending on your mobo this will support up to 4 of the 6 ports leaving you only 2x to connect to the Motherboard directly<link>https://www.newegg.ca/Product/Product.aspx?Item=9SIA6RD6CK3314</link>), fan controllers (Would recommend a 4 pin fan wire splitter instead), you name it you really don't have much for limitations on that department. B) It's got an extra expansion slot on the rear for adding an additional add-on such as an exhaust fan <link>https://www.newegg.ca/Product/Product.aspx?Item=N82E16835119065</link> wireless cards, and pretty much any expansion card but you may need a riser board if you don't have room in the normal 7 slots but do have a PCi 1X free on your board. 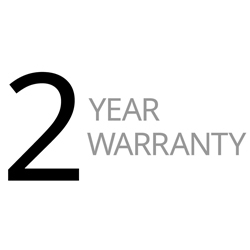 C) 2x 120mm fan's in front, 1X on side (up to 140mm also) 120mm on rear, and dual 120mm on top, or a 200MM fan fits also which is what i have <link>https://www.newegg.ca/Product/Product.aspx?Item=N82E16835103072&Description=cooler%20master%20200mm&cm_re=cooler_master_200mm-_-35-103-072-_-Product</link> but it really isn't a fabulous fan, does the job though and make my build match the mobo aka Black and red. D) Both side doors come off with ease, but I've replaces the second side panel's holding screw with a matching black one that is the same as the one on the other door so i don't need to grab a screwdriver all the time. G) Metal frame is very solid, can take some serious abuse panels not so much but I've been careful with those, but have dropped the PC one or two times in 5 years. H) Fits any GPU I've thrown at it thus far and plenty of room to spare. I) Fairly spacious inside for all its options. A) It's a pretty heavy beast but that being said it is durable and solid. C) hooking up for power and reset plugins are a bugger to hook up if you have big hands, wish they were in a single block like some other towers instead of individual wires like an old PC is, there is a part i could get to solve that issue as it doesn't come with one, but I don't deal with those things very often in my PC so w.e. D) Mesh in front gets dirty and ugly fast even after cleaning with a toothbrush and dustoff for an hour and a half, but eventually it all comes out, only to get nearly as dirty again in a month. (yes i clean my PC a lot) and starts to drive the temp up. I leaned my pc about a week ago now, hence it's low temps today. F) Wish it had more USB 3's or a USB C-Type, USB 2.0 is useless to me mostly but is functional. Also don't use the mic and headphone jacks as my headset is USB 3, Would like to use the front panel to hook up both my head set and my xbox one controller instead of the headset in the rear and limiting my reach. G) This thing is pretty ugly not gonna lie, at first it looked kinda rugged and cool, But After seeing many of the towers available over past 5 years i'm not such a fan of it's looks.. It is however far more functional then 80% of towers available in 2019, so i won't be changing up any time soon. Took one star off because i do have issues, it isn't the Perfect case, but close. Pretty hard to get 5 starts on anything IMO, unless you have 0 con's, in which i don't. All-in-all would most certainly by this tower again its available, and would recommend it to anyone. @CoolerMaster, Bring an updated version of this case AND the Workbench version back, [my buddy picked up the Workbench, when i grabbed mine (last two in store) both were amazing cases to work with and we both still have them he grabbed a second workbench 2 years ago.] I would use these cases any day over any other if it was always my decision but customers always get what they want and usually this look doesn't meet their want's because so many other cases are prettier. I think if you had on front panel, Power reset buttons (obvs), and 2x USB 3.0's 1X USB C-Type Mic Headphone (for those who still use those). All power and reset wires in a block that goes over your 8-1 pin on a mobo, and quieter fan's also an RGB option for those what want that and on that version an RGB controller of some sort built in. Keep the rest the same as moving PSU i think would change the functionality of the case, and the mesh keeps the inside fairly clean. I think it would continue to sell. Other links you might be interested in checking out. Other Thoughts: I'd recommend this case, I've used it for 3 years with no issues. Pros: Everything fits. No sloppy cuts or holes. All tapped holes are tight for screws. Easy to remove all covers. Slide on bars for HDDs (3.5) so they slide in and latch, no screws! Lots of small hardware including zip ties for cables. Pros: I like the looks. The inside is unpainted (which I don't care about) and the front is plastic-y, but otherwise this has a nice, clean, rugged look. I'm not a fan of flashier case designs. This case looks like it means business. Air flow is great. This is a really roomy case for this class. The components don't feel crowded, and that's with a push/pull CPU cooler and a very large graphics card. Plenty of fan mounts. I wound up ditching the two that came with the case for better replacements, but it's still nice that it comes with two out of the box, and that will be plenty for most folks who aren't OC'ing or OCD'ing (a little bit of both apply to me). The drive bay configuration is really well-designed. Removing the larger cage and mounting the 2.5" cage on top of the 3.5" one makes the case even roomier with better front-to-back airflow, while leaving plenty of bay space for the average user who doesn't have more than a few hard drives. The price is very nice too. Frequently goes on discount and stacks up very well in the category of budget-but-full-featured cases. Cons: No front USB 3.0 ports. Not that bad, because I have plenty in the back, but this would be a nice feature. 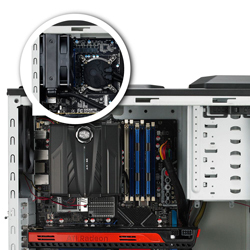 This is partly the case and partly my motherboard design, but I wish there was just a little bit more clearance between the top fan mounts and the top of the motherboard. With an H80i cooler in push/pull configuration, I only have room for a 120mm fan at the top of the case. The cable management only seems average. There are plenty of anchors and I have everything organized in decent shape, but other (mostly more expensive) cases have some more advanced management options. The case manual is a bit of a joke. I mean, it's just a case, but for anything I had any questions on I had to kind of read the tea leaves on vague drawings. Other Thoughts: Overall I really like this case for the price. If I could dock half an egg for the cons I would, but since I can't, I like it enough to leave it at five. The HAF line in general seems like a very solid series. Pros: This case lives up to its reputation as a roomy and well made product. Great value in its current price point. Replacing an outdated case that I've used through multiple builds. Cons: None to speak of at this price. Some bells and whistles are absent, but I knew what I was buying.I like the understated look of this case, but if you want something flashier you can find it at this price. Other Thoughts: I mailed in rebate information well within the time-frame and never got so much as a response. The case was a good deal at the price, and tbh I expect most merchants to renege on rebate offers. I'm not going to cause a racket over it. However, if the rebate is the tipping point for your purchase, be aware that many vendors simply don't honor them. Only buy if you won't be disappointed at the listed price. Mail in rebates are hit-or-miss in general.